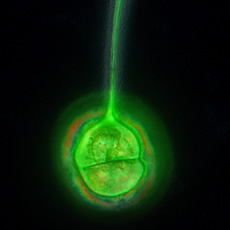 A green fluorescent protein (GFP) labeled strain of the coral pathogen Vibrio coralliilyticus. CAIRNS, Australia -- The elusive culprits that are killing countless coral reefs around the world can now be nabbed with technology normally used to diagnose human diseases, marine researchers say. Coral researchers and reef managers will be able to identify coral infections using a new method that allows them to classify specific diseases based on the presence of microbes. This could lead to more effective action to reduce the impact of disease on the world's imperiled coral reefs. "Current classification of coral diseases is mostly based on a description of how the coral has deteriorated, such as the pattern of tissue loss and abnormal colors," says Joseph Pollock, a PhD student at the ARC Centre of Excellence for Coral Reef Studies. "This is an ineffective way to identify coral diseases because different diseases can often look very similar. For instance, in the Caribbean alone, more than six "white" diseases show the same characteristics of tissue loss exposing white coral skeletons. Coral diseases can be caused by a number of different microbes, including viruses, bacteria and fungi. Knowing exactly which toxic organism leads to a particular disease is therefore important for accurate diagnosis � and for planning how to manage or control its impact. One of Pollock's supervisors, David Bourne from the Australian Institute of Marine Science, says that the recent worldwide decline of coral reefs has been accompanied by increased disease, creating an urgent need for a deeper understanding of the various diseases, including what harmful bacteria and viruses contribute to different coral diseases, what triggers them and how they spread. "Instead of relying on appearances to tell us what disease the corals have, we need to determine what's happening to them before the symptoms show. This will help us to control, or reduce the impacts." By applying a diagnostic technology commonly used in human disease identification or in forensics, Mr Pollock has found a diagnostic method that can accurately detect and quantify the coral pathogens in a sample of diseased coral. "The technology is called quantitative-PCR (qPCR) and is often used in human medical research. qPCR works as a genetic fingerprinting technique that both detects and quantifies a specific DNA molecule in a sample. It can detect pathogens at even very low levels � as few as a couple of bacteria in a cup of seawater," Mr Pollock says. Apart from testing corals for the presence of pathogens, researchers can also use the technology on water samples to gauge the general health of the wider coral reef environment, Mr Pollock says. "This technology is sure to have many applications in the future", he says, "as marine environments are put under pressure by multiple impacts from rapid coastal development, declining water quality, and climate change". The group's paper "The urgent need for robust coral diseases diagnostics" by F Joseph Pollock, Pamela J Morries, Bette L Willis and David G Bourne was published in PLoS Pathogens on October 20, 2011.
technology is fascinating, and seems to show promise in a much needed application. keep up the good work.